‘’Our company, Umbuso recognises a clear problem with people and their obsessive use of technology. 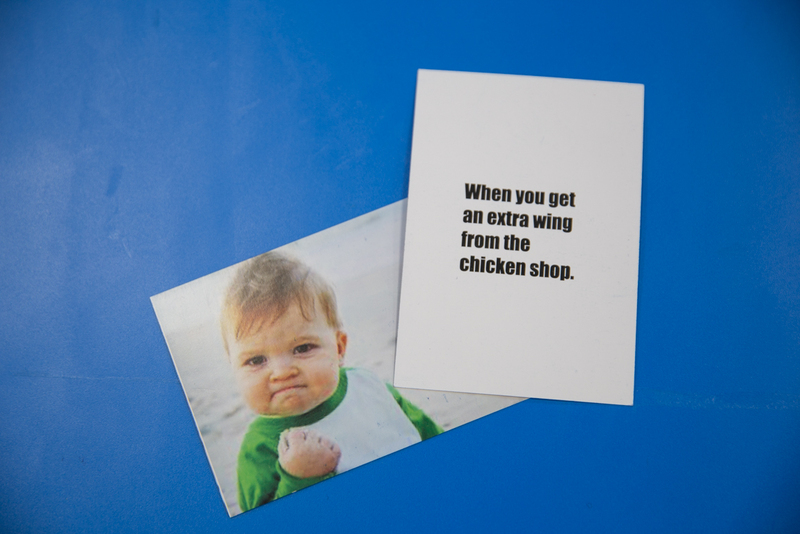 Therefore, we created a fun, young and unique card game. 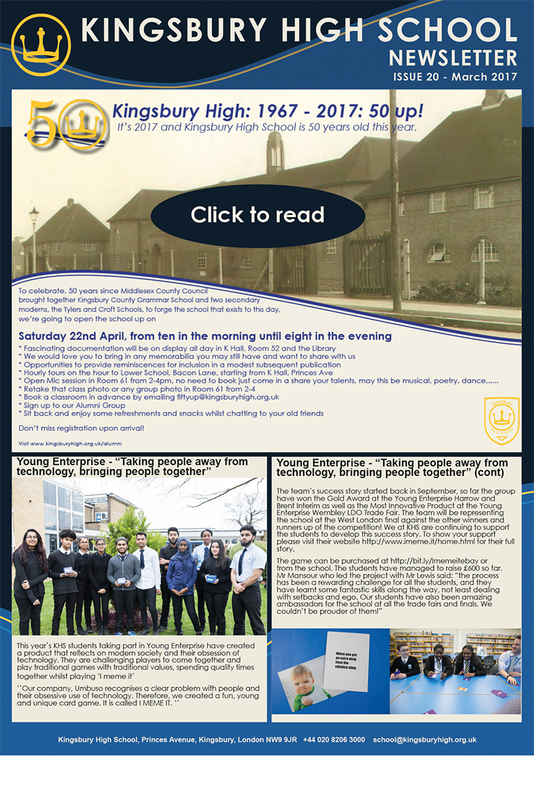 The team’s success story started back in September, so far the group have won the Gold Award at the Young Enterprise Harrow and Brent Interim as well as the Most Innovative Product at the Young Enterprise Wembley LDO Trade Fair. The team will be representing the school at the West London final against the other winners and runners up of the competition! We at KHS are continuing to support the students to develop this success story. To show your support please visit their website http://www.imeme.it/home.html for their full story. Although the official World Book Day was earlier this month and the school wasn’t able to host the event on the set date, the library didn’t deprive the students of the experience and enrichment World Book Day offers and hosted the event on Tuesday 21st March. 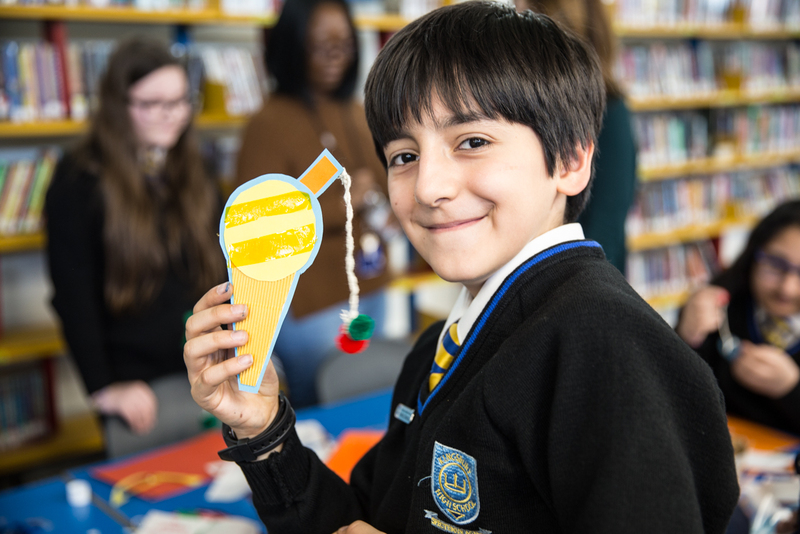 As part of the celebration, students attended a number of workshops throughout the day including a bookmark making session, opportunities to look at newly released books and write recommendations of their favourite books for their fellow students. The library had a great turn out with many students turning up, enjoying the workshops and walking away with new books recommended by their friends. 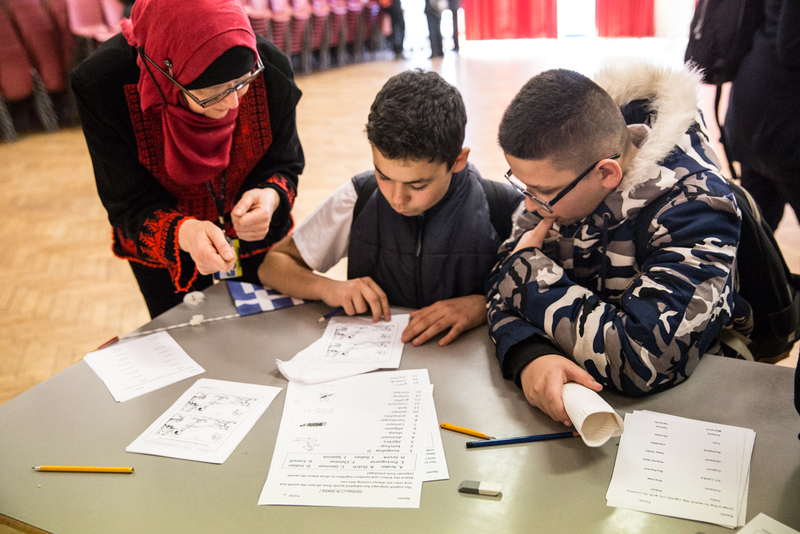 On Wednesday 15th March the English as an Additional Language (EAL) Department held their yearly ELA Day on which we celebrated the diversity of culture at Kingsbury High School. The event took place at lunchtime when our students were selling homemade traditional cakes including the delicious ‘Kingsbury Cake’ made by George in Year 7, invited others to take part in quizzes on different countries and the audiences got to enjoy students as well as staff perform a number of songs. It was a great opportunity for the students to present a part of their culture to the School Community to work as a team, feel unified and proud of the diverse community we have at KHS. Thank you to all who contributed to the event, especially Erik Windrich who played the guitar, Alexandra for singing, to the Facilities Department, Food Technology Department, The Catering Department for their support and Tamara Faires-Back who photographed the event. Students and staff were treated to a lecture by David Smith, who gave an introduction into the knowns and unknowns of Dark Matter. This intriguing quote by Donal Rumsfeld, US Secretary of Defence (2002), was used to open the Dark Matter lecture and captivated the interest of the audience from the start. 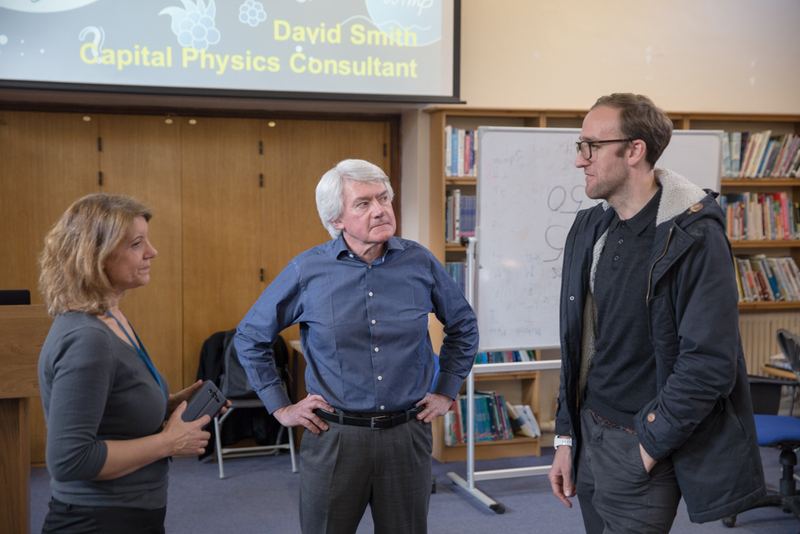 David Smith is a fellow of the Institute of Physics and the Royal Astronomical Society and he sits at the editorial board of the IOP Journal Physics Education. Mr Smith explained how the idea of Dark Matter started as a crazy way to explain some irregularities in the motion of stars around a galaxy. In the carefully prepared presentation, Mr. Smith, teacher of the year (2000), unveiled some of the evidence for the existence of Dark Matter and described some of the current attempts to find it. The well-attended event, showed once more the interest at Kingsbury for Science in general and Physics in particular. 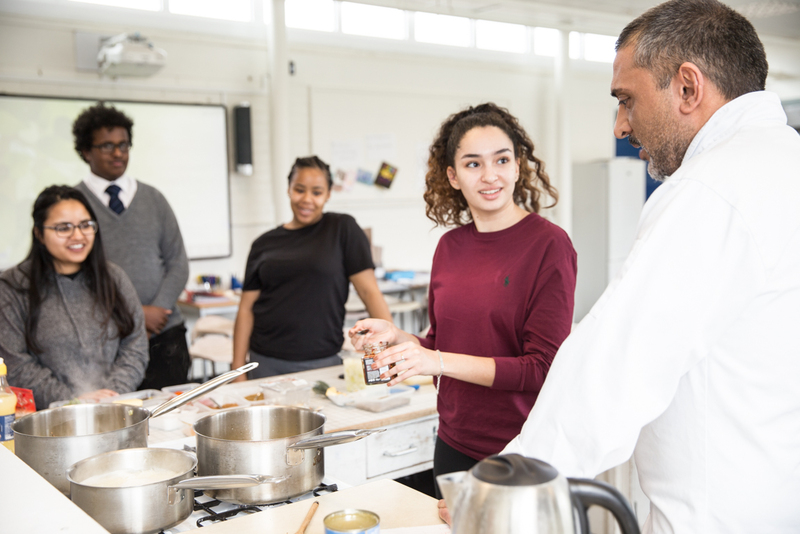 During our most recent Excel Day, where KHS proudly goes beyond traditional learning in a class room, a wide range of topics, workshops, talks and presentations were offered to all the year groups. Highlights of the day include Years 7 getting the opportunity to learn to ride a bike as well as improving their cycling skills throughout the day. Some students that we not able to cycle at the start of the day, walked away having learned a fantastic new life skill and they should be very proud of themselves. 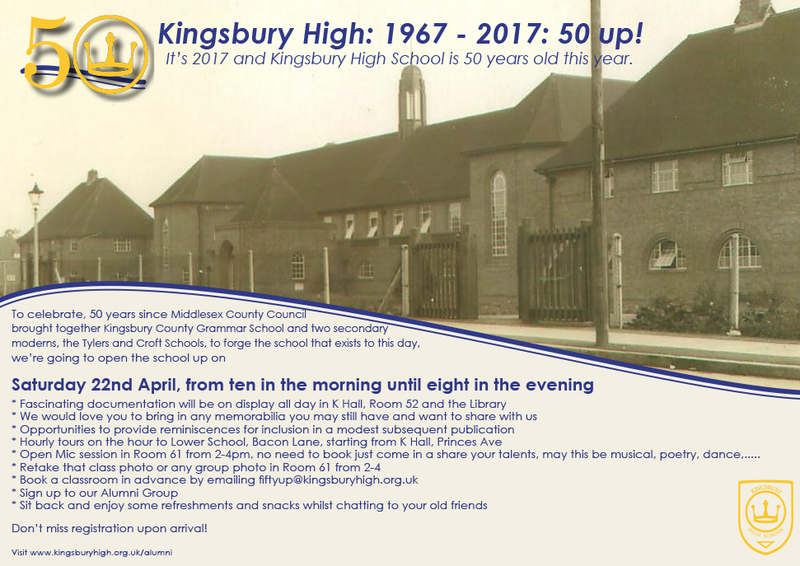 There was also a call for the day to become a Kingsbury tradition, though the Sixth Form team will be exploring ways in which they can integrate activities throughout the year rather than just on a single day in the future. Special thanks go to Ms Cox for leading on the administration of the event, with support from Ms Mohan and Ms Maan, and to all those who delivered sessions during the day.